Easily edit your own website. Images - including uploading images from your own computer that are automatically resized. The Drupal CMS is open source software that has a large community support network and includes many applications especially designed for interactive websites. Drupal has built-in Search Engine Optimization (SEO) features that help Drupal CMS sites appear high with Google and other search engines. Administrators have an 'Edit' option on every page, allowing you to easily edit a page via the same interface that visitors use when viewing the site. Administrators can easily add new pages, photos and products and edit every aspect of the site. Drupal has a range of tools that facilitate the creation of e-commerce platforms, multi-lingual websites (including English and French admin options), discussion forums, interactive Google maps and literally thousands of other applications. To use Drupal, you login in to the site and then on every page you visit you have 2 options - View and Edit. The View option allows you to see what other people see, the Edit option allows you to change the content on that page. To create new pages you simply select 'Create Content' (which appears on every page when you're logged in), specify the title of the page, what the link to it should be called and then start typing - using a CK editor which, as you will see, is an interface similar to Word or other word processing software. The editor allows you to put things in bold or italics, add bullet points or number lists, left align, right align or centrally align text, change font size, add links to other sites, add images, etc. etc. The Drupal CMS also allows us or you to add additional features to your website, such as allowing other people to post comments on news items, creating Discussion Forums, or asking visitors to vote on a particular topic. You can automatically organise items by date and choose to show the most recent news items on the home page, add products to a catalogue yourself and much more - the possibilities are endless! 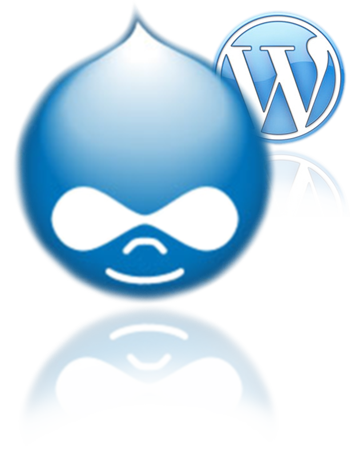 Read our Drupal tutorial for beginners or more reasons to choose a Drupal website.